I’m working on a new version of my Studio banner. I absolutely love the black, white, and red version that was in Scrap-Appliqué Playground, but to be honest it looks better in person than it does reduced and printed on a pattern cover. The scraps with the white background seem to fall away and blend into the background too much at a small size. This time I gravitated toward my beloved palette of red and blue with a touch of green. It’s gonna pop a lot more on the pattern cover! 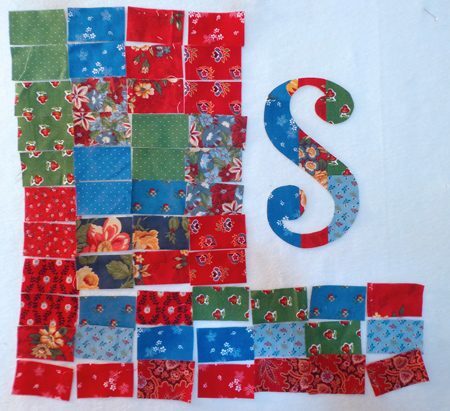 I’ve got my scraps sewn together and the letters cut out. The rectangles will compose the border. Right now I’m just waiting on some fabric that I ordered for the background. You see, I’m slightly obsessed with polka dotted backgrounds, but when I dug through my stash I found out that I had used all the pieces until there wasn’t a hunk big enough! As soon as the fabric arrives, I’ll be ready to go. In the meantime, my summer hiatus is over and I’m headed to Sonora, California, this weekend for the Sierra Quilt Guild’s show. I really enjoy this annual trip up to gold country.